Iran's Minister of Road and Urban Development Abbas Akhondi announced that representatives of Boeing aircraft manufacturing company will come to Iran in the near future. "We are in contact with Boeing and their representatives will soon arrive in Iran," Akhondi said in his talks with French Foreign Minister Laurent Fabius last Wednesday, the content of which was disclosed on Monday. He also said that during his recent trip to France, he has negotiated with Airbus, whose airplanes currently account for 50 percent of Iran's air fleet, and demanded its executive manager to provide a plan for the renovation of the country's commercial air fleet. 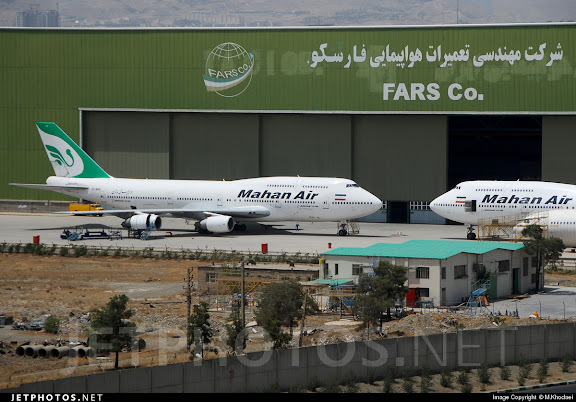 Earlier on Saturday, Mohammad Khodakarami, deputy head of Iran's Civil Aviation Organization (CAO) told the Tasnim News Agency that the country plans to purchase 80 to 90 Boeing and Airbus airplanes every year to renovate its commercial air fleet. He added that the text of the final nuclear deal recently reached between Iran and six world powers, known as the Joint Comprehensive Plan of Action (JCPOA), explicitly states that bans on Iran over the purchase of airplanes have been lifted. "We need to add 80 to 90 airplanes (to the fleet) each year in order to have 300 young and active airliners by the next five years," Khodakarami noted. COMMENTARY: The Iranians appear already to be leveraging Airbus and Boeing against one another for the better deal in obtaining new civilian jetliner aircraft. Similarly, Minister Akhondi commented on projected purchases for its railroad infrastructure, claiming "100 locomotives have been purchased from France’s Alstom" and "at the same time the ministry has started its negotiations with Germany’s Siemens Company for the renovation of the country’s railroad system". So much for self-sufficiency... couldnt do any of those things on its own. At the end Akhoonds had to bow their heads to recieve help. I've had enough of trolls invoking the idea of self-sufficiency when even countries like Russia and China import most of their civilian airliners. We all know Iran doesn't in fact have self-sufficiency when it comes to jets, whether military or civilian. Obviously they're going to import what they need until they learn how to manufacture it themselves, which isn't easy when we're talking about massive airliners. For Iran to put its economic house in order , it needs to fundamentally rethink its political posture .As Henry Kissinger once said , Iran needs to be a normal country rather than a revolutionary cause . A normal Iran would be seriously seeking membership into Shanghi Cooperation Council for example , and distance itself from rogue actors such as Lebanese Hezballah or Syria's regime .Those steps serve Iran's cause and regional stability more than any order of locomotives possibly could .Of course , French Peugeot automobiles are a different story altogether . If there is anyone who needs to "fundamentally rethink its political posture" when it comes to the middle east it is the west not iran.Iran is seeking membership in the sco indeed had it not been for the sco stupidly going along with sanctions iran would`ve been a member years ago,now that the sanctions are being lifted membership should be a mere formality.As for irans support of its allies,the west has no problem supporting rogues like israel or saudi or terror groups like the mek,so why shouldnt iran support the lebanese resistance or the legitimate government of syria which is currently fighting against foreign backed terror groups like the fsa or isis.Iran abandoning its allies might help the wests cause but it wouldnt help iran or regional stability,indeed the west would be much better served if it would accept the iri as it is and not as the west would wish it to be,the nuclear deal is perhaps the first sign that however reluctantly the west is finally,slowly starting to do this. Last time I looked all monies belonging to Iran were slowly drip fed back into Iranian banks on condition of the regimes cooperation. The regime was forced to cooperate because Iran was very close to bankruptcy.So yes they were forced to bow their heads to their western masters. Wasn't the Quds ("Jerusalem") Force created to liberate Jerusalem? The IRGC and the Quds Force have been fighting against the Arabs instead. Today, in the three-front war, the Iranians are fighting Sunni insurgents in Iraq and Syria and supporting Shia insurgents against Sunni Arabs in Yemen. Where do Israel and the West fit in this picture, aside from sloganeering? We cannot pick and choose principles based on the politics of the day. You say Iran is supporting the legitimate government in Syria. Well, it is also supporting Shia insurgents against the legitimate government in Yemen. What we need to realize is that the region is in an upheaval rarely seen in modern times. State and non-state actors are fighting with each other and among each other. Iran has made clear choices in the region: supporting Shia-led governments and Shia insurgents; all sectarian choices, making the country the defender of the Shias in a region with majority Sunni population. Could it succeed? It probably will be a mixed result, victories in parts of Iraq and Syria, losses in other parts as well as in Yemen. These three conflicts will not end soon, they are developing into stalemates, and probably end in the disintegration of the countries as we knew them. Could Iran afford continuing its current military involvements? Probably not, but most probably will continue for ideological reasons. Looking at the recent developments , Iran seems to be seriously over-stretched in Mid-East .It's true that Teheran exerts some influence in Arab Capitals of Beirut, Damascus, Baghdad and Sana'a , but it's only propping up unhelpful characters and forestalling a decent outcome in those places .Iran's weakness is due to lack of any real appeal of revolutionary theocracy ;regime is very unpopular at home and why should it be any different elsewhere . Instead Iranian efforts should be focused on Iraq and Afghanistan by combating ISIL and Taliban elements . Iran's support of the Houthis is minuscule probably because the Arab coalition did not let Iran to give its full support to the Houthis, no? If Iraq and Syria are any indications, Iran would have sent hundreds of Quds Force advisers into Yemen; have deployed Hezbollah advisers and specialists, have sent Shia militias from Iraq, Afghanistan and Pakistan to Yemen; had set up joint military operations centers with the Houthis; and have shipped tens of tons of military hardware and billions of dollars of cash to the insurgents. That's what Gen. Soleimeni would have done, but that's where Iran was stopped by the Saudis and the UAE. This does not mean Iran will not attempt to send/smuggle weapons into Yemen, probably through Oman by land; but that amount would not match the volume if Iran had the same free hand as it had in shipping weapons to Iraq and Syria. Iran's support would not have been minuscule, indeed would have been huge after the Iranians saw the golden opportunity presented to them by the Houthis, but the Arab coalition stopped that. That's what really happened. My two-part comments above were about Iran's role in Yemeni conflict, and its inability to follow the model it developed in Iraq and Syria: deployment of hundreds of Quds Force/IRGC advisers, thousands of foreign Shia militias, large amounts of weapons, and setting up joint operations centers here with the Houthis. The Iranians were prevented to follow that model in Yemen by the KSA/UAE coalition. Your reply above deals about the future of the conflict. Your predictions are noted. I had already said the three conflicts, in Yemen, Syria and Iraq, have unfortunately all the markings of becoming stalemates and the three countries disintegrated. You had also asked a question as to why the Quds Force (QF) did not deploy advisers/militias into Yemen before the Arab coalition blockade. You may want to direct your inquiry to the QF's leadership, as my answer would just be a guess. However, if you are interested in my take: (a) The QF has sent advisers/arms to the Houthis at smaller scale before the blockade. (b) Iran did not expect the change in leadership in Riyadh would bring in a new team that would be ready to openly challenge it in Yemen, militarily. The Saudis in the past four decades or so had been so conservative and a radical move like that was unexpected. Add to that, the readiness of UAE to also get involved militarily in Yemen, again unexpected for the Iranians. Sorry Nader but that makes no sense,if iran was going to support the houthis it would not have waited until the arab blockade to do so,thats like saying that the gulf states only began supplying weapons to isis/fsa after iran and hezbollah got involved in syria when it was clear that their support was there from the beginning of the insurgency.Its funny you obviously buy into the arab narrative that iran was behind the houthi revolution/is aiding the houthis but now you claim that iran either sent a tiny amount of aid or waited until it was too late to aid them at all?,again that makes absolutely no sense,I`m sorry nader but your argument has more holes in it than a swiss cheese,if iran was going to aid the houthis it wouldnt have waited on the arabs to get involved before it acted it would simply have done so from right the start.